Damascus, Md. ; Steven Westrup, Protection, Kan.; and Jared Bourek, West Point, Neb. Twenty K-State students applied for Henry C. Gardiner Scholarships awarded to undergraduates with an emphasis in animal science. The field of 20 was narrowed to seven candidates who interviewed for the $5,000 awards to continue their field of study. Michael Cropp, Damascus, Md., is a junior majoring in animal sciences and industry with a minor in food science. Michael is a member of the meats judging team, currently a director on the National Junior Angus Association Board and is actively involved in the Angus business in his home state. He, as a young decision maker in his own cow herd, is applying science and technology through genomic profiles and genetic selection using artificial insemnation and embryo transfer. Cropp plans to continue his education post graduation. He will participate in a K-State faculty led trip to Brazil this summer to gain global beef business experience. Jared Bourek, West Point, Neb., is a senior majoring in animal sciences and industry, pre-veterinary, with a double minor in Spanish and agricultural economics. Jared has been involved in the livestock industry his entire life, having worked in both pork and beef production. Jared is currently employed at the purebred beef teaching unit and plans to enter veterinary school upon graduation. Jared has accepted a summer internship at Cattle Empire, Satanta, Kan., gaining valuable experience and further maximizing his educational opportunities. Cattle Empire is one of the largest family owned cattle feeding operations in the United States. Steven Westrup, Protection, Kan., is a senior majoring in animal science with a production and management option. Feedlot management and the health and well being of young, high stressed calves is of particular interest to Westrup, having gained valuable experience through his employment in custom growing and feeding environments. Steven has expanded his educational experience through his studies in Israel last year. Upon graduation, he plans to join his family's ranching operation. All candidates must complete a detailed application. A designated panel conducts interviews with each of the finalists. Applicants are evaluated on academic excellence, work ethic, leadership potential and attitude. Recipients must express an interest in animal genetics, animal nutrition, animal health, reproductive management, agribusiness management or marketing. "The caliber of applicants is invigorating and their curiosity to learn is contagious," said Mark Gardiner. "Henry Gardiner possessed that same contagious curiosity. 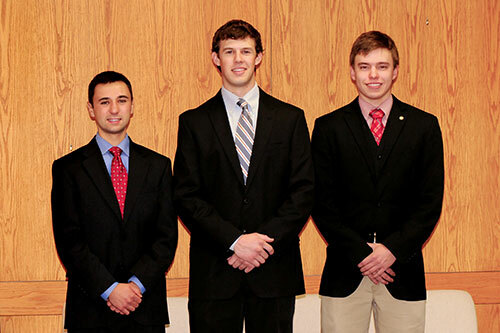 We could not be more pleased to award scholarships to Michael, Jared and Steven. We also want to thank each applicant for applying and encourage each of these outstanding students to continue to work hard and make a difference. The beef industry needs you." The Henry C. Gardiner Scholarship is possible through the generous contributions of Gardiner customers, friends and family in an effort to continue the legacy of Henry Gardiner. Students classified as a rising-junior, junior or senior, either enrolled in or planning to enroll at Kansas State University with a major in animal sciences and industry or closely related field may apply. Scholarships are awarded annually to students meeting rigorous criteria and exhibiting a passion to focus on improving the beef industry. Since the first scholarships were awarded in 2012, a total of ten students have received $40,500 in unrestricted financial assistance through Henry C. Gardiner Scholarships. Gardiner Angus Ranch (GAR) is a family-owned and operated business that produces registered and commercial Angus cattle. The original ranch was homesteaded near Ashland, Kan., in 1885 by Henry Gardiner's grandfather. The ranch encompasses more than 46,000 acres. The Gardiner operation sells approximately 2,000 bulls and 1,500 registered and commercial females each year. Over 80 percent of the sale offering each year is the result of embryo transfer. GAR is a founding member of U.S. Premium Beef, the producer-owned limited liability corporation with minority ownership in National Beef, the nation's fourth largest beef processing company. By providing access to a proven value-added processing system through GAR delivery rights, GAR customers have received more than $5.57 million in premiums and dividends.